Discovery is seen from the International Space Station as the two orbital spacecraft accomplish their relative separation, March 7, 2011. The Smithsonian's Air and Space Museum is preparing to welcome the space shuttle Discovery into its collection. 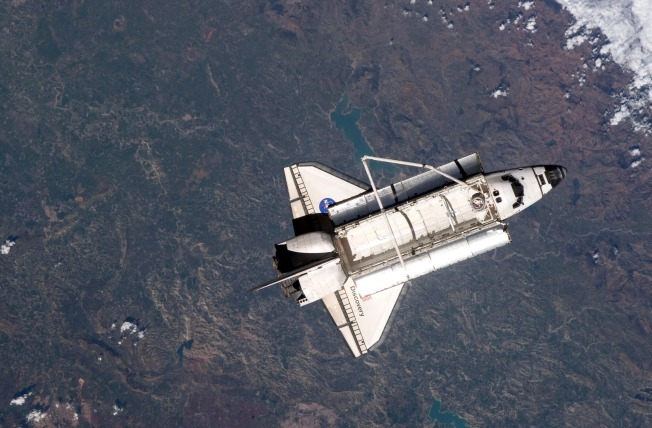 As one of NASA's five space shuttles, Discovery made 39 flights before retiring in March 2011. The shuttle will be flown to Dulles Airport on the back of a Boeing 747 in April, said Smithsonian Secretary Wayne Clough. A flyover is planned above the District before Discovery heads to its new home at the museum's massive hangar in Northern Virginia. A museum spokeswoman later said the flyover has not been confirmed, and details are still being finalized. A formal welcome ceremony is planned for April 19 at the museum's Udvar-Hazy Center in Chantilly, Va. The center already has the space shuttle Enterprise on display. Another space shuttle, Endeavour, will travel to the California Science Center in Los Angeles in the second half of the year.